Palm Sunday narrates and remembers Jesus’ entrance into Jerusalem before his passion and crucifixion (Matt 21:1-11, Mark 11:1-11, Luke 19:28-40, John 12:12-19). It is often referred to as “The Triumphal Entry” to refer to the hopes of the people that Jesus might bring with him the military might of King David and his mighty men. The people proclaimed the words of Psalm 118:25/Matthew 21:9 “Hosanna (Grk transliteration of ‘Save us, we pray’) to the Son of David, Blessed is he who comes in the name of the Lord! 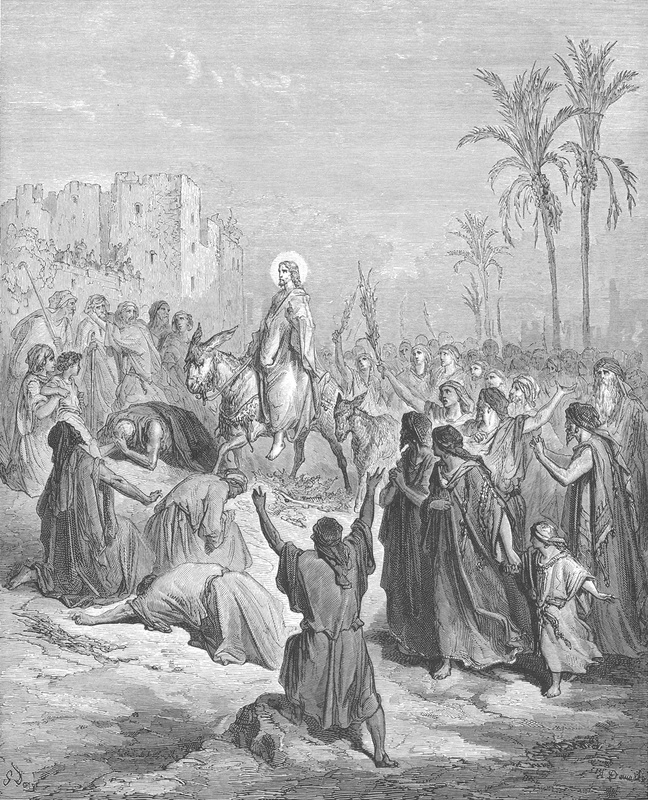 Hosanna in the highest!” The humility of the donkey – a traditional symbol of peace (Zech 9:9-12), and the fleeing of the disciples spoke more to the true nature of his soon sacrificial pilgrimage to the cross. Churches often use processions and palm branches as part of their celebration of this Sunday. Both of these speak to demonstrations of military prowess and might. The Triumphal Entry alludes to the Roman Triumph, and the Palm branches were considered a symbol of triumph and victory in Jewish observance. Even on Palm Sunday (like every Sunday) we are reminded and look to the victory of Jesus on the cross over sin and death. mp3 | leadsheet | thomlin arr. Awesome. Who even needs a sermon? !